How can we be more inclusive? “Only two industries refer to their customers as ‘users’: computer design and drug dealing.” – Edward Tufte, Statistician and professor at Yale University. View The Dangers Of Digital Exclusion on Notist. We made it to the future! As we push further into the 21st century AI, big data, VR and AR are all now a reality. With developers and designers experimenting with this brave new world of connected tech, voice UI, facial recognition and more, we’re living in exciting times. But what about those who lack our digital privilege? 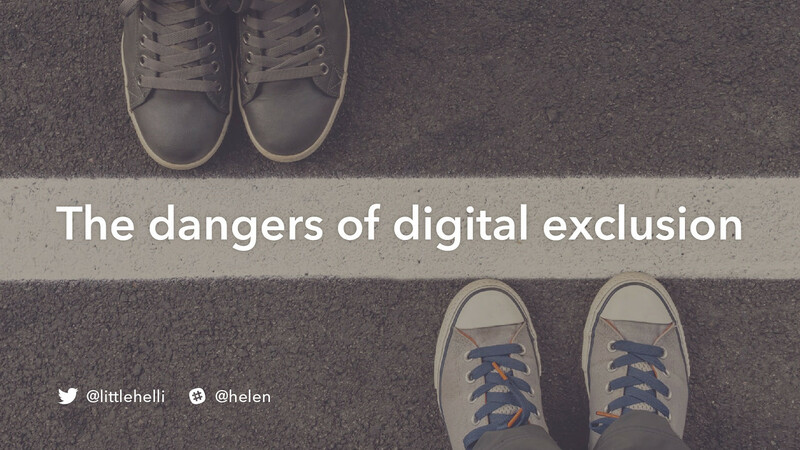 Digital exclusion is a reality for many people in the UK and across the world. But as less visible presences do they make it into our personas and user stories? Or are they left on the sidelines? Is the quest and drive for innovation alienating the very people we should be designing and building for? It’s our responsibility to look out for all our users, not just those who can keep up with us. Innovation and inclusion are not, and shouldn’t be mutually exclusive. But the caveat of that is that inclusion must be considered from the beginning. So many times we see solution-led design, where ideas are developed without thorough user research that then fail to meet real-world problems. As makers in tech, we have the power to massively hinder or improve lives; not those of ‘users’ but of people. This talk looks at what it means to be digitally excluded and how we can design and build products and services that are not just appealing to us, but life-changing to those who use them. Helen puts presentations on for free. You can too. The Microsoft Inclusive Design manual is an great introduction to the concept of inclusive design. A resource to help us "not regret the things we will build". We all have a responsibility for making our products work for everyone, and one of the simplest ways of doing this is to diversify the people who work in tech.